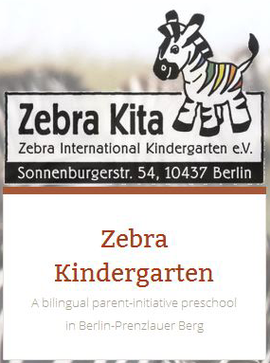 Zebra Kita is a German-English parent initiative kindergarten in Prenzlauer Berg, Berlin. We are a small kita with 18 children in one mixed-age group. The children range from 2 to 6 years of age. Almost all speak both English and German at home; in the past we have had at least one child who spoke only English when he joined the kita, but this is a rare exception. Some Zebras also speak a 3rd language such as French or Polish at home. We are a group of parents who want our children to develop these two languages in a friendly environment, but this is not our only goal. To learn about our other educational aims, take a look at our Kita concept. The Kita is organised and run by parents from all over the globe. It’s a challenging, sometimes demanding, but ultimately rewarding endeavour that we thoroughly recommend. Since first opening in August of 2004 we have been located at the end of a dead-end street near Falkplatz. We were able to purchase the kita space from our previous landlord in March 2012. Though this is neither a financial gain nor loss in the short-term, it gives our kindergarten some long-term security in a neighborhood of rapidly rising real estate prices. Looking for a spot for your child? Read here about how to apply to Zebra Kita. Please contact the parents if you have any questions or comments. Please do not call the kita. The teachers cannot give any information about the kita or how to apply. We also ask you not to visit unannounced as that disturbs the smooth running of the kindergarten.